The deaths of critically endangered right whales in Canadian waters is raising alarms. Three more carcasses of the whales were found in recent days on the west coast of Newfoundland and Labrador. That brings the total of right whales found dead in the Gulf of St Lawrence to to at least nine since 7 June. Each death is a conservation concern given that only around 525 of the species are believed to still exist worldwide. The Marine Animal Response Society (Mars), a charity organisation dedicated to the conservation of marine mammals, said on Monday that the recently discovered carcasses are in poor condition. Canada's Department of Fisheries and Oceans (DFO) confirmed that at least one is a new specimen and was able to collect valuable images and samples for genetic analyses from the remains. They say it is critical to examine every animal to gather as much information in order to pinpoint the cause of death. Mars director Tonya Wimmer said that there is no one particular cause behind the concentrated spate of deaths. "Some had signs of blunt trauma, one had chronic entanglements, we do know that there were other animals out there swimming with fishing gear on them, so it seems sadly for this population to be the standard story for them," she said. Threats facing the whales include ship collisions, fishing gear, habitat degradation, and contaminants and noise. 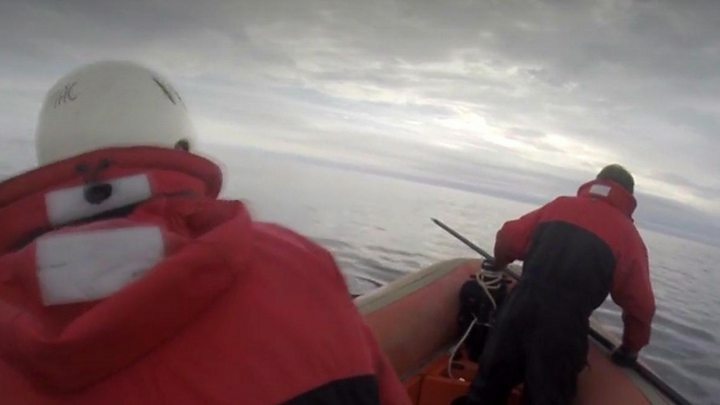 But Ms Wimmer says the number of deaths in a short period and in one area - Gulf of St Lawrence - is "exceptionally unusual". DFO, Mars and the Canadian Wildlife Health Cooperative are among the Canadian and American organisations trying to figure out why so many right whales are dying this summer in those waters. Ms Wimmer suggests it is likely a combination of factors, including more whales in the region at this time of year and increased human activity. Right whales have been using the Gulf of St Lawrence more over the last four to five years and science, government and industry have been slow to catch up, she says. "It just happened to be in this year the bottom fell out," Ms Wimmer said. Just five right whales were born this season and many of the whales found dead were of reproductive age. In July, Canada took some additional steps to protect the North Atlantic right whale, including a partial early closure of the snow crab fishing area where whales are known to frequent and asking commercial fishing vessels to be on alert. DFO has conducted necropsies on six of the dead and results are expected in the coming weeks. Their habitat ranges from the coastal waters of the south-eastern United States to the Gulf of St Lawrence.